It’s a new month and we’re not long into a new season as well, so I’ve a fresh set of cross-stitch smalls on display. I’m trying to keep it fairly seasonal so there is a lamb, a gosling and a fluffle of bunnies too this month as Easter is approaching and we’ve also seen rabbits on the back lane for the first time in years, it’s nice to see them but also slightly worrying when it’s so close to the garden! I stitched the April small last year, it’s from the Joyful World SAL by Matya of Snowflower Diaries, I’ve still to make the last three so I need to start stitching those sometime over the summer or October will be here before I know it! I stitched the Hello Spring one and the cute rabbit with a daisy over the last couple of months, I made the most progress on Hello Spring when I was stranded on a train for five hours! It’s free design from the website Il Est Cinq Heures. It wasn’t the easiest to stitch as it’s cross-stitch over one thread – not my favourite! The daisy rabbit is designed by Dany Chevalier, there’s a cute one of a rabbit with a daffodil too which is on my to do pile! 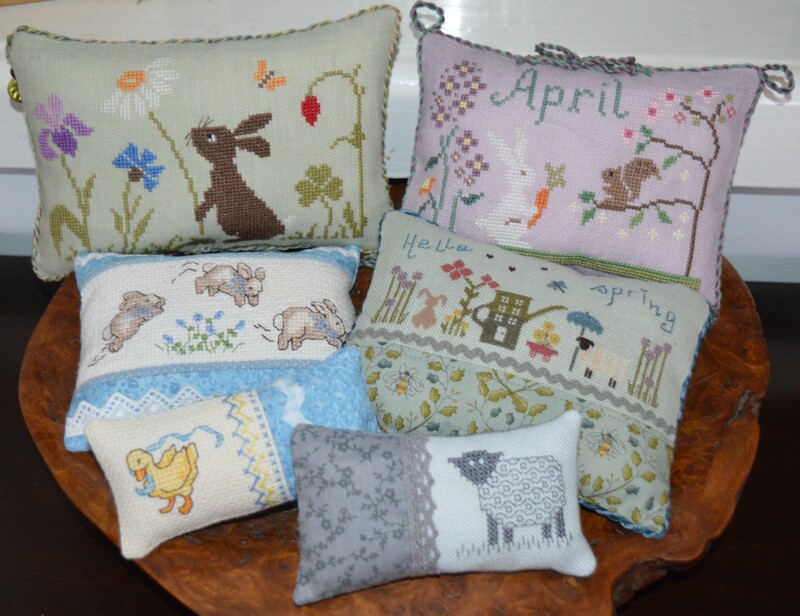 The two light blue ones with the jumping rabbits and a gosling were stitched over twenty years ago, they were on a bib (rabbits) and a nappy pin cushion, a few weeks ago I had a bit of session and turned baby cross-stitched things into smalls. The little blackwork sheep at the front is in the collection as the fields are full of tiny lambs at the moment, all gamboling around in the sunshine! I stitched it last year as a practice run for a blackwork square I volunteered to stitch for my Embroiderers Guild. I’m enjoying having my little seasonal display, it means they all have their moment of glory, rather than just being sat in a cupboard. I think I need to stitch a few more summery ones now. This entry was posted in embroidery, Smalls of the Month and tagged Cross-stitch smalls. Bookmark the permalink. It may have been a fiddle, but the ‘hello spring’ design is lovely… my favourite of all of them, I think. April here has arrived with sunshine and rain and a surprising hail storm today; not quite the sort of April shower we would normally expect. I so enjoy seeing these smalls. 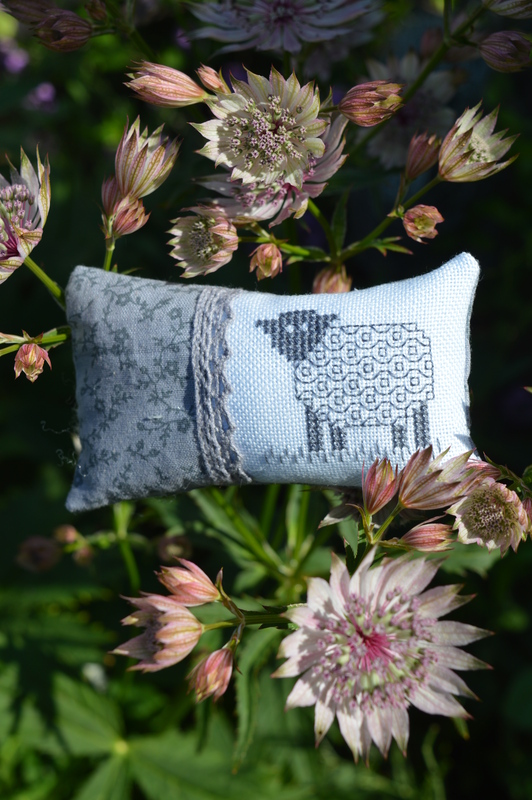 I especially like the blackwork sheep. Loving little foxy – a great way to welcome in the spring! Love the sheep and the smalls are sweet. My favorite image is the one at the end with the flowers and sheep pillow! They are cute. Loving the Hello Spring one in particular. 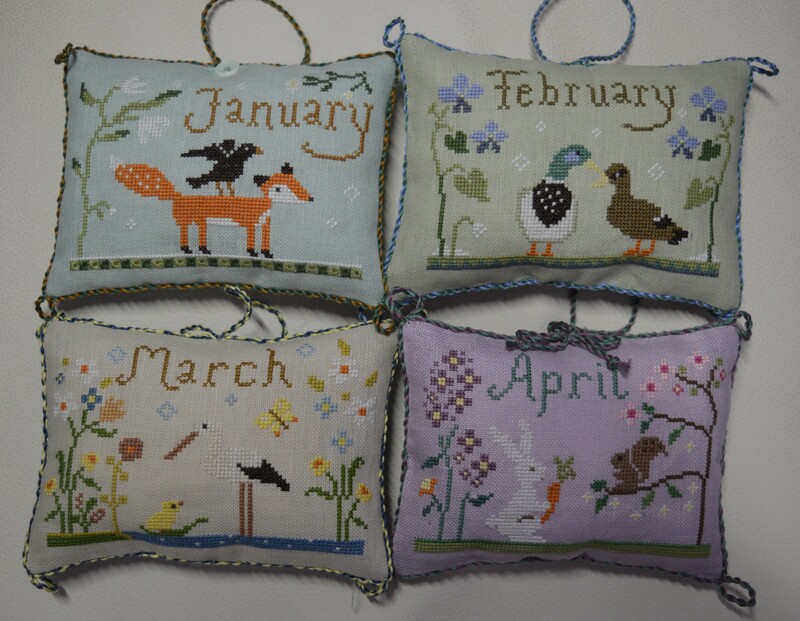 I just wondered what you do with them all – the monthly ones are like a little stitched reminder of what part of the year it is – a little stitched ‘calendar’ of sorts! I keep most of them in what we call the old bureau, it has glass fronted shelves so I display them in there when they’re not part of the monthly group.